This year at our annual Martin Luther King Jr. Day celebration we will gather to consider MLK's legacy, hear his message with fresh ears, and accept his prophetic call to resist injustice in the forms it presents itself as we commit to work for justice in the places we find ourselves. This year we have the special honor of having Dr. Evelyn Carter, Dr. Percy and Lileah Harris’s granddaughter as our keynote speaker. Dr. Carter will share from her expertise around matters of colorblindness and race relations. Dr. Carter will speak at Coe College at 9 am as part of morning Coe MLK Day events, which begin at 8:30 am. Dr. Carter and her mother, Anne Harris Carter will lead a workshop entitled “Roots of the Past, Fruit of the Future” at 2 pm at the Cedar Rapids Public Library. Starting at 5:30 pm at St. Paul’s, we will have a community meal where all are invited to share in a time of fellowship. Free-will offering. 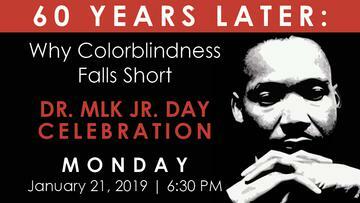 At 6:30 pm, St. Paul’s will host our annual celebration with music from area choirs, keynote speaker Dr. Evelyn Carter will address the failures of colorblindness, and the annual "Dr. Percy and Lileah Harris 'Who Is My Neighbor' Award" will be awarded to an individual recognized for diligently working for justice in Linn County. Dr. Carter is a social psychologist who is passionate about using social science to inform how we engage with the world around us. Her research on how people detect and discuss cues to racial bias has been published in peer-reviewed journals, and her work on successful strategies for confronting racial bias was funded by the National Science Foundation. Dr. Carter is a self-described data geek and frequently presents across the country and internationally. 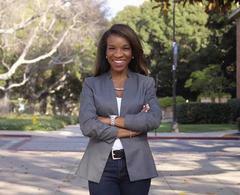 Having most recently served as Director of Translational Research & Anti-Bias Training in UCLA’s Office of Equity, Diversity and Inclusion, Dr Carter is also co-founder of Illuminate Diversity Consulting. In 2019, Dr. Carter joined Paradigm Strategy, Inc. as a Senior Consultant. Dr. Carter holds a B.A. from Northwestern University, an M.A. from University of Illinois at Chicago, and a Ph.D. from Indiana University. She is the proud granddaughter of Dr. Percy and Evelyn Lileah Harris and daughter of David and Anne (Harris) Carter. She lives in Los Angeles, CA.